Built in 1833, the Arulmigu Sri Maha Mariamman Temple is the oldest Hindu temple in Penang, Malaysia, and features fascinating sculptures of gods and goddesses over its main entrance and facade. It is located at Lebuh Queen (Queen Street). It is also known as Mariamman Temple or Queen Street Indian Temple. Throughout the years, the Sri Mahamariamman temple has also been known by several names: Sri Muthu Mariamman Temple, Sri Arulmigu Mahamariamman Temple, Sri Mariamman Temple. All these names refer to the same temple. The temple is open daily from 6.30 am – 12.00 noon and 4.30 pm – 9.00 pm. It became a place of worship as early as 1801 and became a temple on 1833. It has stood at the same place for more than 200 years. Lebuh Queen, George Town 10200 Penang Penang Malaysia. 6.30 am – 12.00 noon and 4.30 pm – 9.00 pm. The temple is in central Georgetown on Lebuh Queen (Queen Street) and the back entrance is on Jalan Masjid Kapitan Keling (Pitt Street), in between Lebuh Pasar and Lebuh Chulia. Located in Penang’s Little India, in the capital city of Georgetown, the Sri Maha Mariamman temple reflects the city’s rich cultural heritage. Visitation to this temple is limited to morning and evening. Temple opens starts from morning 6 am till 12 pm and evening from 5 pm till 9 pm. The temples closes after the prayers are performed at 12 pm and 9 pm respectively. Daily there will be Pujas (prayers), mornings 7.30 am and evening 6.30 pm. Prayers are usually conducted by the temple priests in these times and visitors may observe these prayer sessions taking place. If you wish to enter the Sri Mahamariamman temple, it would be polite to ask permission from any of the priests and please remember to remove your shoes before entering the temple grounds. The Mahamariamman Temple back entrance in Jalan Masjid Kapitan Keling (Pitt Street). This tropical island of Penang, lies in the Indian Ocean, just off the north-west coast of Peninsular Malaysia. Penang’s rapid growth as a trading hub in the early 19th century, especially in commodities such as nutmegs, cloves and pepper attracted traders from Europe, America, Arabia, India as well as China. Each then established communities, and adopted lifestyles similar to their homeland. It was during this time that the Tamil Indians arrived in the island’s bustling harbour, and established their own ‘Little India’ community in the city. The early Indian settlers, who came to this island to toil and trade, established this beautiful little abode for mother, so that her poresence can be felt as their guardian deity and guide in their times of trials and tribulations. Dating back as early as 1801, the Sri Mahamariamman Temple is recognised as an elaborate and spiritual place of worship. 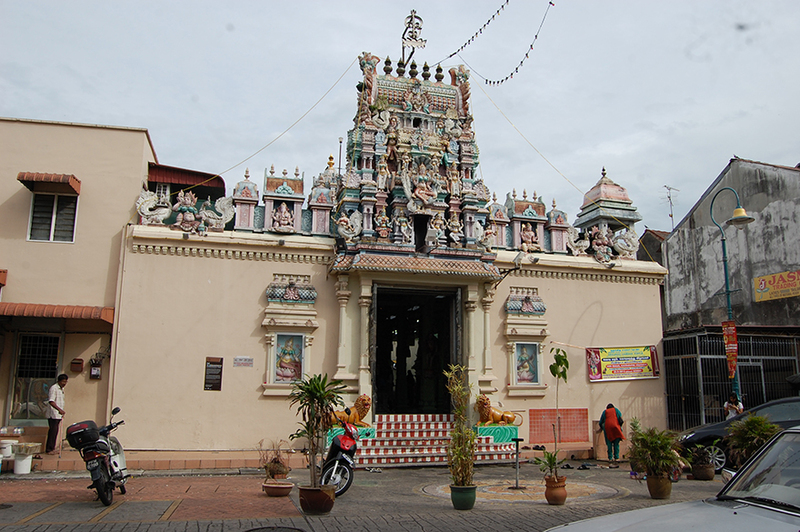 Like most Indian temples in Penang, the Penang Sri Mahamariamman began as a small and simple shrine. Not much is known about the early days of the temple or of the persons who founded it. The land was granted in 1801 by the British to Betty Lingam Chetty, who was then the Kapitan (Headman, Kepala or Community Leader) of the Tamils and South Indians. This is confirmed by another grant written in 1831. But, as to how the temple came to be built on this land or who founded it, there is no information. Caption James Low confirms the existence of a temple in Georgetown in 1835. The fact that the Mariamman temple was founded in 1833 is first mentioned in a notice of ‘Kumbabishegam’ (consecration ceremony) held one hundred years later in 1933. But except for the date, not much else has been said about its founding in that document. Built originally as a shrine, it was later that the Indian community found a need for a proper temple ground for worshipping. This was to accommodate the ever increasing Indian community presence on the island. This was done to ensure that the Indian community, which includes the merchants, labourers and sepoys are settled in one particular area, for ease of managing the group. The majority of the people who lived around the temple were waterfront workers who were the backbone of the Penang port. These Indian stevedores were organised in groups called kootam – a member of a kootam is a kootakadai, and heading each kootam is a thandal. Together, the Indian community numbered about 2000 workers and they inhabited the area bounded by Lebuh Queen, Lebuh King, Lebuh Penang, Lebuh Pasar and Lebuh Gereja, an area collectively known as Ellammuchanthi in Tamil, or Simpang Lelong in Malay. The Sri Mahamariamman shrine was enlarged into a temple in 1833. Incidentally, since this was when it became a proper temple, the year 1833 is taken as the year that it was founded. At the time of its founding, it was known as the Sri Muthu Mariamman Temple. It was only in 1980 that it became known by its present name, Sri Arulmigu Mahamariamman Temple although the name is often written as Sri Mariamman Temple, Mahamariamman Temple and so on. From its inception, the temple provided an important place of worship for early Indian immigrants and is now an important cultural and national heritage. In those days, it was done to ensure the Indian community, which includes the early working settlers like merchants and laborers are settled in one area to ease managing them. By 1833, the shrine through the efforts of the Indian settlers, turned to a temple and was renovated to its present form a hundred years later. According to a document of civil suit brought before the courts in 1904, the names of five trustees who looked after the temple from 1892 till 1904 are Veerasamy, Murugan Chettiyar, Govindasamy Pillai, Veleritta Taver and Meyappah. The temple came under The Mohamedan and Hindu Endowments Board in 1906. From then onwards this temple has been administrated by the management committee appointed by the Endowment Board. It appears that from the beginning of the Endowments Board’s administration, a few temples and other institutions have been clustered and left under the care of this management committee. They were Arulmigu Sri Balathandayuthapani Temple in Waterfall (Hilltop), the Arulmigu Sri Ganesha Temple in Waterfall, the Arulmigu Sri Mahamariamman Temple in Queen Street, Hindu Cemetery and Cremation Ground in Batu Lanchang and a Hindu Funeral Rites Ground in Jalan Air Itam. From 1967 onwards, the board is known as the Hindu Endowments Board, which is currently managing this temple. The Hindu Mahajana Sangam, which was formed in 1935, has had close association with this temple and other temples under the care of the same management. many members have served in both institutions. They have also been associated with the temple’s formation, renovation and maintenance. It was only in 1933 that this temple acquired the present form and structure. In that year the temple was extensively renovated and consecration ceremony was held in 12 June 1933. According to the notice of the consecration ceremony, the foundation stone for the new structure was laid by Mr. V. Natesam Pillay, JP. The Sri Muthu Mariamman temple having become too small and too decayed, the Hindu gentlemen of Penang, with their initiative and preserverence, have bought up two buildings to the north of the temple, expanded the presence space and formed a temple in accordance with the Siva agamas a sanctum, Arthamandapam (antechamber), Mahamandapam (hall), prakaram (circumambient), vimanam (dome), surrounding walls and Rajagopuram (entrance tower). These renovations were carried out by a management committee consisting of S. Ekamparam Pillai, C. Subbaraya Pillay, S. P. Natesam Pillay, P. Kalimuthu Vandayar, K. V. Karuppiah Thandal and M. R. Raju. It is also known that further repairs were done in 1958 and a consecration ceremony, albeit on a small scale was carried out under the leadership of Mr. Doraisamy Thevar JP. Since 1958 no repairs or renovations were done to the temple. This caused some serious decay to the structures and sculptures. In 1978 till 1980 extensive renovation was done. A sculptor from the Academy of Sculptors in Mahapalipuram, Chennai and two assistant sculptors were brought from India to restore the structure. Although the basic form of the 1933 structure had been retained, many new areas have been added. A new hall 31 feet x 27 feet, suitable for small religious functions has been added. over this, another story has been added for administrative offices. While most of the sculptures have been preserved, some new ones have also been added. 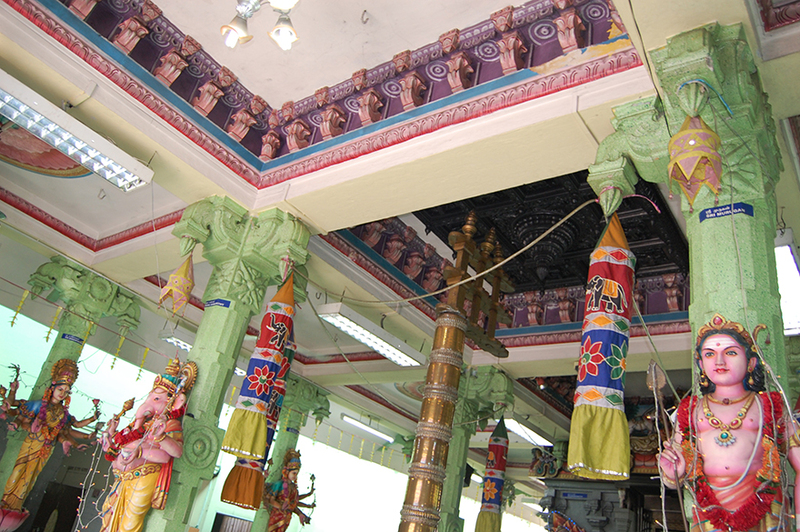 the statues of the nine forms of Sakthi now surround the outerwalls of the sanctum. The inner walls of the sanctum, antechamber and the floring of the whole temple have been changed. the entire temple has been repainted. The smaller shrines of Visvanathar, Visalatchi, Chandikeswarar and Bairavar have domes of their own which have been gold plated. Within the sanctum, a new statue of Mahamariamman, towering over the main deity, has been formed. At the feet of the main deity, a Sri Chakram has also been erected. The temple’s name which was known as Sri Muthu Mariamman Temple till then was changed to Arulmigu Sri Mahamariamman Temple. The present renovation was begun in mid-1997. While basically preserving the existing temple structure, some minor modifications were made such as replacing of tiles in the sanctum and the whole temple flooring, replacing the peedam in the sanctum, replacing the Komugi, a new Ganesha, Visveswarar, Rahu and Kethu icons, new Navagraha peedam, new flag post with concrete base, statues of Bala Ganesha and Bala Murugan, Ashta Lakshmi 8 statues and 2 lion statues on the left and right of the temple main entrance. The Mahamariamman Temple gopuram (tower) and vimanam (dome). Built in the south Indian Dravidian style, the temple most outstanding feature is the impressive gopuram (tower). Rising above the entrance, it features Hindu deities, soldiers and floral decorations. On the entrance of Penang Sri Mariamman Temple, you get to see a 23.5 feet tall sculptured tower or Gopuram. Also the 38 statues of Gods and Goddesses and 4 swans featuring the Hindu Goddess Mahamariamman in Her many incarnations such as Meenatchi, Kamatchi, Visalatchi, Bhuvaneswari surrounds the colorful four-tiered crown. It is topped with five small kalasams. With subsequent renovations carried out over the years by Hindus artisans and sculptors from India and locals, from makeshift huts to heavily ornate and brightly shining with diamonds and precious stones, Penang Sri Mahariamman Temple is a sight to behold. The interiors of the temples are heavily sculptured with deities of Lord Ganesha is in the left pillar and Lord Muruga, his brother, is on the right pillar. The eight female figures adorning the pillars inside the temple are of Ashta Lakshmi (Goddess of Wealth). On the left wall there are sculpture of the Nadaraja and Sivakami in dancing posture of the cosmic dance. Many statues of deities, gods and goddesses can be seen on the walls surrounding the inner shrine of Penang Sri Mahamariamman Temple. The primary deity Goddess mahamariamman is seated at the moolastanam (sanctum) of the karuvarai (sanctum sanctorum). The temple has an artha mandapam (antechamber), mukha mandapam, mahamandapam (hall), prakaram (circumambient), vasantha mandapam (festive hall) and kodi maram (flag post). The signs of the zodiac are carved in wood on the ceiling. The dome or vimanam of the temple is on a base 12.5 feet square and has a height of 27.25 feet. This is in three sections and contains 20 statues of gods and goddesses and 12 lions. Its kalasam is 3.5 feet and is gold plated. The back entrance tower is 10.5 feet high and contains 13 statues of gods and goddesses and 4 lions and a swan with partially human form. Once every 12 years, in keeping with Hindu tradition, the temple is reconsecrated. Previous consecrations are in 1933, 1958, 1980 and 1998. Mariamman is popularly worshipped by overseas Indians, especially Tamils because she is looked upon as their protector. She is the Goddess of disease, rain and protection and is associated with enormous powers in the physical realm, particularly destructive, and protects her devotees from unholy or demonic events. Historians claimed that the worship of Mariamman started as a tribal religion of the Dravidians. Mariamman is a manifestation of the goddess – Parvati, an incarnation embodying Mother Earth with all her terrifying force. In the Hindu pantheon, however, the original mother form of the Maha Sakthi is the Primal Source of All Energy – from where everything – all matter and energy comes. The Sakthi is credited with the creation of Brahma, Vishnu and Siva, the three main gods of creation, sustenance and destruction. The word Mariamman come from two words: “Mari” meaning “power” and “amman” meaning “mother”. Maha stands for great. So this Mahamariamman temple tells you, it houses the great powerful mother. And some Indians considers Sri Mariamman to be the mother of Lord Ganesha and Lord Muruga. So to many locals, when asks which temple they are going, some simply said “Amman Temple”. Mahamariamman, the primary deity is seated at the moolastanam (sanctum) of the karuvarai (sanctum sanctorum) facing east. Ganesha and Subramaniyaswami are installed at the artha mandapam (antechamber) facing east. There is a surrounding circumambulatory path. At the mukha mandapam we may find the vahana (vehicle) of the Goddess which is lion, the bali peedam (sacrificial altar) and the kodi maram (flag post) is also found facing west towards Mahamariamman. Stone carvings of the cosmic dance of Lord Nadaraja and His consort Goddess Sivakami are found at the wall facing south at the vasantha mandapam (festive hall). 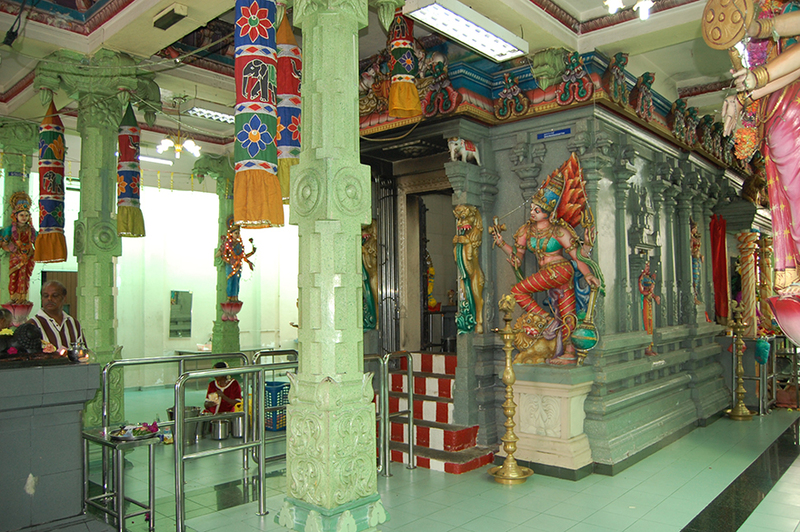 Shrines for sub deities facing east are Lord Visveswarar and Goddess Visalatchi are installed at the left and right side of the sanctum sanctorum respectively. The shrine of Lord Chandikeswarar is facing south towards the sanctum sanctorum. The shrine of Lord Bairavar is found at the north east corner facing south. Lord Thatchinamoorthy facing south and Vishnu Dhurga facing north are installed at the outer wall of the sanctum sanctorum. The Navagraham (nine planets) are found at the north east corner of the temple. Housed within its ornately decorated interior is the priceless panchaloka (an alloy of five metals: gold, silver, copper, zinc and tin) statue of Lord Ganesha, Lord Subramaniyaswami and Mahamariamman embellished with gold, silver, diamonds and emeralds. The priceless Goddess Mahamariamman’s statue is paraded on a wooden chariot during the Vijayadashami day on the end of the Navarathiri festival. The priceless Lord Subramaniaswamy’s statue figures prominently in the annual Chithra Pournami festival when it is borne on a wooden chariot through the city streets to the Arulmigu Sri Balathandayuthapani Hilltop temple in Waterfall, Penang. The temple is particularly packed on Navarathiri, Chithra Pournami, Deepavali and Thaipusam with thousands of devotees eager to offer their prayers on the holy days. In the year 2008, there was a big celebration commemorating the temple’s 175th anniversary. The most auspicious event for the temple is the Navarathri festival. The festival begins with the lion flag raising ceremony and ends with a procession where the panchaloka deity of Mahamariamman is paraded in a decorated wooden chariot through the streets of Little India. (Navarathri is nine nights vegetarian festival). According to the Hindu Puranas (holy books), the festival is held to commemorate the victory of Goddess Parasakthi over the demon king Mahishasuran. It was stated that the evil king ill-treated the people that they turned to the goddess, who is the consort of Lord Shiva, to save them. Goddess Parasakthi fought a battle for nine days and ultimately destroyed him on the 10th day, which is known as Vijayadashami. Various Indian organizations and communities would sponsor the prayers for each nights. On the Final tenth day of the celebration, Vijayadashami is celebrated by Hindu Mahajana Sangam. The sangam organized the chariot procession for many years from Queen Street, Sri Mahamariamman Temple to Dhoby Ghaut in Air Itam. The festival celebration is concluded after shooting of arrows from the chariot in the evening in the Dhoby Ghaut. The chariot returns to the temple at about midnight the same day. Since the late 1970s, the organization of the chariot procession had been taken over from the sangam by the Temple committee and the Hindu Endowments Board. The chariot procession is now confined to fort Cornwallis area in the Esplanade. However, the sangam still continues to celebrate the annual Navarathiri festival’s final tenth day Vijayadashami Ubayam every year without fail. The Hindu Mahajana Sangam, with notable among the festivals, the annual Chitraparuvam Festival which is celebrated in the Tamil month of Chithirai (April/May) every year, is organized with a chariot procession of the panchaloka deity of Lord Subramaniyaswami from Queen Street Sri Mahamariamman Temple. It is the day of the first full moon of the first Tamil month. In early years, the festival starts with special pooja and ubayam for the Hindu Mahajana Sangam “Koota Kadai” in Queen Street Mahamariamman Temple, the chariot procession commences in the early morning 7.00 am and reached Waterfall Dewan Mahatma Gandhi (Gandhiji Ashram) in the afternoon, the deity then carried and placed in the ashram until the return journey of the chariot to Queen Street Sri Mahamariamman temple in the evening of the same day. Since early 1970s this festival is celebrated for three days. The deity of Lord Subramaiyaswami brought procession from the Queen Street Sri Mahamariamman temple passing through many street and roads before reaching the Waterfall Arulmigu Sri Ganesha temple. The deity is carried up to the Hilltop Arulmigu Sri Balathadayuthapani Temple. The second day would be the Chitraparuvam Festival where the deity would be taken procession around the hilltop temple compound in the evening. On the third day evening, the deity would be carried down and placed on the chariot procession journey back to the Queen Street Sri Mahamariamman temple. In 1990, the Hindu Mahajana Sangam imported a new chariot from India, for the annual Chitraparuvam Festival celebration to replace the old chariot which was found to be not road worthy and in a decaying condition. Celebrated on the Tamil month of Thai (January/February). Although it is celebrated in the Waterfall Arulmigu Sri Balathandayuthapani Hilltop temple, Sri Mahamriamman temple is not left behind as there are religious activities associated with this festival. The Hindu Mahajana Sangam members carry a traditional kavadi weighing approximately 80 kilos known as “ Atta Kavadi” since 1926 from Queen Street Sri Mahamariamman temple in the evening to Dewan Mahatma Gandhi in the Waterfall temple compound with traditional “Nadhaswaram” accompanying the “Atta Kavadi”. A late night dinner is served in the Dewan Mahatma Gandhi after the arrival of the “Atta Kavadi” . In the early years the arrival of the “Atta Kavadi” signifies the conclusion of the annual Thaipusam festival celebration for the day and devotees are not expected to carry any kavadi after the “Atta kavadi reaches the Waterfall temple compound. The Penang Nattukottai Chettiar community hold prayers in this temple prior to the Thaipusam festival. This function is called the ‘Kuthirai Vahanam’ (Horse Car) held on in the Tamil month of Markazhi (December/January). The prayers would start 10 days earlier where there would be ubayams on these days. On the tenth day, the decorated panchaloka deity of the Mahamariamman which carries a ‘Vel’ would be placed on the Horse Car. The procession begins from Queen Street at the evening, displaying the ‘Vel’ passing through various streets and roads and end up at Queen Street Sri Mahamariamman temple around mid-night. The Maha Shivaratri is dedicated to the Lord Visveswarar where the devotees would observe the prayers, all day fasting and an all night long vigil. Celebrated every year on the 13th night/14th day in the Krishna Paksha (waning moon) of the Tamil month of Maasi (February/March) that is, the night before and day of the new moon. Abishegam (ceremonial bath) is conducted at 10 pm, 12 midnight, 2 am and 4 am respectively. Pujas would commence at 11 pm, 1 am, 3 am and 5 am respectively. Throughout the night devotes would chant and hyms of the devotional songs. Monthly full moon of every month is observed where prayers are done for Lord Visvanathar. Special abishegam, prayers and puja would be conducted at 12 pm followed by vegetarian lunch that would be served. Weekly Rahu kala puja is conducted on every Tuesdays between 3.30 pm and 4.30 pm for Vishnu Dhurga amman. Abishekam (ceremonial bath) is conducted by the temple priest for the goddess. Devotees which mainly consists of ladies, would sing hymns and chant praise of the goddess. The goddess would be decorated with flowers and mainly with garlands of limes. Lighting lamps made of limes is a major ritual in this prayers. On this special days, devotees will be vegetarians for the day. Young ladies wanting to marry will come to offer prayers asking from the “mother” for a good husband. Married ladies will pray for a successful marriage. The Tamil month of Aadi (July/August) is considered an auspicious one for prayers for Amman. Sangabishegam (conch ceremonial bath) is done in the evenings on every Friday for Mahamariamman and every Tuesday for Vishnu Durga. Aaadi Pooram is also celebrated. Ladies would carry pots containing turmeric powder diluted with water as an offering for the abishegam of Mahamariamman.